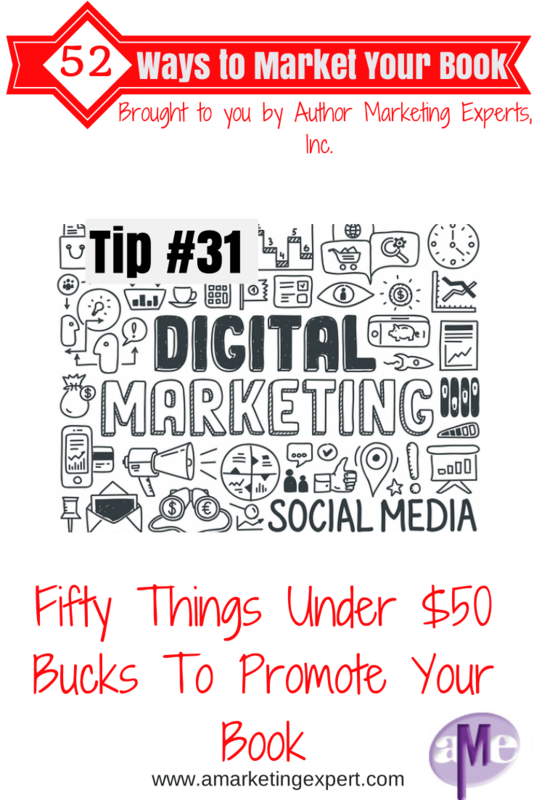 Fifty Things Under $50 Bucks To Promote Your Book: Tip #31 of 52 Ways to Market Your Book | Author Marketing Experts, Inc. Welcome to Tip #31 of our 52 Ways to Market Your Book! I hope you’re enjoying these tips and they are helping you sell more books. Want the complete book of tips? Get it here! These days it seems like everyone’s book marketing budget is a little tighter. If you’re feeling the pinch, or if you’re just looking for some great free stuff to do on your own, here are some tips that could help keep you on track. Buy your domain name as soon as you have a title for your book. You can get domain names for as little as $8.95. Tip: When buying a domain always try to get a .com and stay away from hyphens, i.e. penny-sansevieri.com – surfers rarely remember to insert hyphens. Head on over to Blogger.com or WordPress.com and start your very own blog (you can add it to your Web site later). Write a few articles on your topic and submit them onto the Internet for syndication. You can submit them to sites like ezinearticles.com and articlecity.com. Check out your competition online and see if you can do some networking. Do some radio research and pitch yourself to at least five new stations this week. Put together your marketing plan. Seriously, do this. If you don’t know where you’re going, any destination will do. Plan a contest or giveaway. Contests are a great way to promote your book. Google some topic-related online groups to see if you can network with them. Send thank you notes to people who have been helpful to you. Do a quick Internet search for local writers’ conferences or book festivals you can attend. Put the contents of your Web site: book description, bio, Q&A, and interviews on CD to have on hand when the media comes calling! Submit your Web site to the top five directories: Google, MSN, Alexa, Yahoo, and DMOZ. Start a Twitter account and begin tweeting. If you don’t think Twitter is significant, think again; it’s been a major part of our marketing strategy for several years now (before anyone even knew what Twitter was). Develop a set of questions or discussion topics that book clubs can use for your book, and post them on your Web site for handy downloads. Add your book info or URL to your answering machine message. Start a Facebook Fan page. Fan Pages are much better than groups because they’re searchable in Google. Find some catalogs you think your book would be perfect for and then submit your packet to them for consideration. If you’re unsure of what catalogs might work for you, head on over to www.catalogs.com and peruse their list. Add your book to Google Book Search. Research some authors with similar subjects and then offer to exchange links with them. Start a LinkedIn page and make sure it’s linked to your other social media pages where possible. Make sure your blog is connected to Amazon via their Amazon Author Central program (yes, it’s free). Subscribe to Google Alerts and make sure that you are getting alerts under your name as well as your book title(s), brand, and keywords. Pitch Oprah. Go ahead, you know you want to. Don’t forget to add reviews to your Web site. Remember that what someone else has to say is one thousand times more effective than anything you could say! Work on your next book. Sometimes the best way to sell your first book is by promoting your second. @bookgal shares tip 31 in a series of 52 ways to market your book! Thanks for putting together this list Penny. How strongly do you feel about a dedicated domain for your book? The reason I ask is that my books are marketing/business tips that I have on their own pages within my full site. I’ve added options to subscribe to chapters delivery, Amazon ebook purchase, and createspace paperback purchase. Given my book pages are surrounded by related content, I’m not so sure a separate domain is warranted. Your thoughts? Some really helpful tips here, things I’ve never even considered, especially regarding pitching to my local media. I completely agree with adding reviews to your website, possibly by downloading the Goodreads widget (I did that for a dystopian short story of mine, “Cruel”), as well as contacting a local library. Not sure I agree with the purchasing of a book’s title for a domain name. According to Writer’s Digest’s Self Publishing Guide for 2014, one should purchase their author name as a domain name. That makes the most sense to me–as you mentioned, the best way to promote the first book is to write and promote the second. So why go with a domain name that is only the title of your first book? I agree with the rest of your points however, and appreciate them!